A nation mourns for Tunisia victims, Princess Charlotte’s christening, a royal visit to Australia and New Zealand in November, Coronation in Tonga and King Richard III: The Musical! 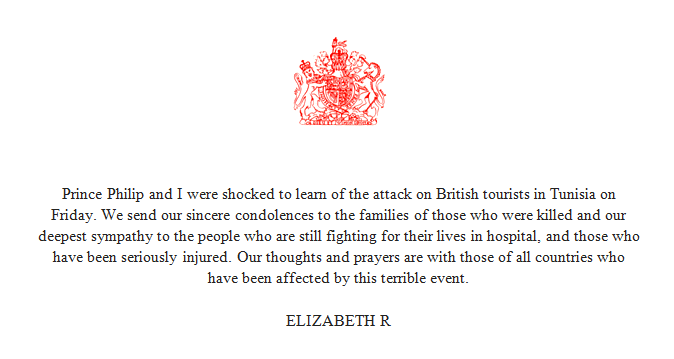 A nation mourns the loss of those who lost their lives in a terrorist attack in Tunisia, including 30 British tourists. Message from Queen Elizabeth II. Advice from the Norfolk Constabulary, especially if you’re arriving early. Princess Charlotte’s Christening coin is available from The Royal Mint. The Prince of Wales and the Duchess of Cornwall will be visiting in November. This photo was taken at the Sydney Opera House on 9 November 2012, during a one-day visit to Sydney. Sir Peter Cosgrove created history in Australia by becoming the first Governor-General on Facebook. Visit Governor-General of Australia for more details and updates. HM King Tupou VI and Queen Nanasipau’u crowned at Centenary Church in Nuku’alofa on 4 July 2015 amidst pomp and pageantry. Just when you thought King Richard was dead and buried, his story becomes a musical. Find out more in this week’s show.